Spend the day acclimatizing. Walk to Kami Hut down to Hauseberg Lakes (Hauseberg Tarn and Nanyuki Tarn). Walk back to Shipton for dinner and overnight. Descend 2hr, 15km to forest clearance to catch a 4x4 transfer vehicle to Chogoria Village where you will connect with your transfer vehicle back to Nairobi, B,L. • Full board accommodation whilst on the trek. • Treated water on the trek. 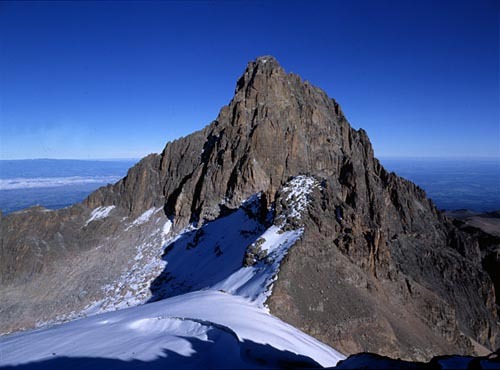 © Copyright 2005 - 2017 - 2008 © Mount Kenya Climbing Expeditions. All Rights Reserved. 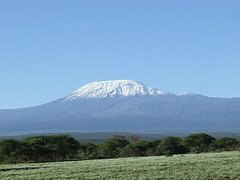 Africa's highest mountain, Mount Kilimanjaro stands on featureless part of the East African plateau, on the Tanzanian side of the Kenya border near Moshi, side by side with the smaller Mount Meru. 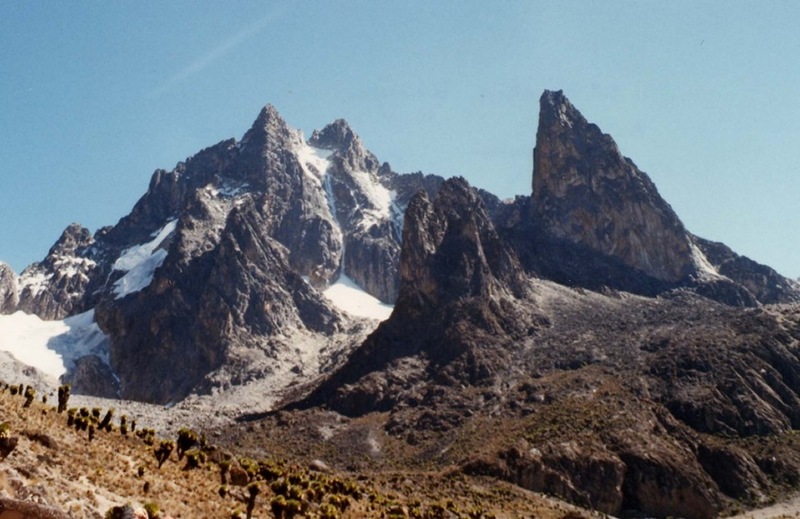 These mountains are extinct volcanoes, with Kilimanjaro actually being the agglomeration of three distinct volcanoes, Kibo (5896m/ 19,340 ft), Mwenzi (5,149 / 16,896 ft) and Shira (3,962m / 13,000 ft). whose violent creation is geologically associated with the creation of the Great Rift Valley, 100km to the West. Mount Meru is Mount Kilimanjaro's little sister, standing at 4,566m compared to 5,895m, but is still an impressive freestanding volcano, which makes a superb four day climb to the top. It last erupted in 1910 therefore can be classified as an active volcano. The first Mount Meru ascent was made by Dr. Fritz Jaeger, 1904. The town of Arusha lies at the base of Mount Meru Trekking, loads of trek companies do this trek. Wild animals are frequently found on this mountain therefore an armed ranger usually accompanies the trekkers.